Dropbox dropped support for all files systems except ext4 on Linux. This is a problem for everybody using an encrypted home directory since those are usually mounted via ecryptfs or similar. The following workaround makes use of an ext4 formatted file system image that is mounted via a loopback device upon login. Change the “remote” part of the paths if you prefer to place your Dropbox folder at a different location. We use the parameter x-gvfs-hide to avoid showing the folder in sidebar of the file manager. Now lets enable and start the service. Slashes must be replaced by dashes if used as systemd parameters. After executing the commands above the service will be started (i.e., the Dropbox folder will be mounted) automatically upon user login. Note for Ubuntu 18.04 or newer: for some reason systemd seems to “forget” the user service after reboot. Please check the comments of this blog post for a solution to this. You can use the Dropbox GUI to move the Dropbox folder location to the newly created one. The way how Dropbox detects the file system in use is a bit awkward as it does not let you choose the mount point itself as Dropbox folder location, instead you need to sync to a subfolder. So if you mount point is remote/Dropbox you need to sync to remote/Dropbox/<username> or something like that as Dropbox does not believe that the mount point is an ext4 file system. This entry was posted in Linux, Software and tagged dropbox, ecryptfs, ext4, Linux, loopback, systemd, ubuntu, workaround on November 15, 2018 by Hannes. The sustainability stream (in which I was involved) published a detailed recap of the OKFestival, don’t miss this! At the same time, videos of most of the sessions have been added to the web page of the streams. Look out for the keyword “video documentation” that have been added to the original description of the sustainability stream. This entry was posted in Conference and tagged Conference, okfestival, recap, session, summary, sustainability, video on October 22, 2012 by Hannes. And so it was time again! We are going to run a two-days Green Hackathon at the OKFestival in Helsinki. The conference will last for the whole week with the Green Hackathon happening on September 19 and 20. I will not write so much more in this blog, I link instead to other sites where event information and press releases have been published. You do not need a ticket for the OKFestival in order to participate in the Green Hackathon, however, you have to sign up at http://lanyrd.com/2012/okfestival-green-hackathon/ to get your name onto the guest list. This entry was posted in Conference, Fun, Programming and tagged cesc, Conference, green hackathon, hackathon, helsinki, kth, okfestival, okfn on September 14, 2012 by Hannes. This morning I started to read a newspaper article about Gotland University College being merged into Uppsala University, but I stopped after the second sentence which basically stated that Uppsala University was the oldest university in Sweden. I remembered a discussion between some friends of mine years ago in which they disagreed on which Swedish university was established first. I don’t quite remember which universities they talked about, but I think it was Lund and Uppsala. Not remembering to which conclusion they came I just wanted to do a quick fact check. The easiest and probably least time-consuming approach would have been to just click through a couple of Wikipedia pages about Swedish universities or just look at the Wikipedia list of universities in Sweden which also happens to include the dates of establishment. Nice, this worked! But was Umeå University really established in the year 17? Let’s check what went wrong by taking a look at the DBpedia page of Umeå University. There are two values for “established”, one as xsd:integer (the wrong one), the other one is an xsd:date (and correct). All other universities use integers. Well, there is not so much I can do about this, except for perhaps falling back to the dbpedia-owl:foundingDate property (which is given for Umeå but no other university). What about university colleges? They are not included in the query result because they are not of the University type. Let’s see how we can include those: perhaps rdf:type yago:UniversitiesAndCollegesInSweden? I dislike several things about this: universities and colleges are summarized in the same property, this should better be a handled by a UNION in the query itself. The country is included too, but I already have a property stating the country in the query. The same applies to rdf:type http://schema.org/CollegeOrUniversity (even though is quite interesting to see that schema.org properties are being used). We saw that SPARQL queries on DBpedia are powerful and can be used for checking some simple facts, but it takes some attempts to build a query that returns the results we need and want. This is mostly caused by the heterogeneity of the queried data (e.g. some deviating properties, see the date of establishment vs founding date), even though it originates from the same repository. This entry was posted in Linked Data, Semantic Web and tagged dbpedia, linkeddata, news, sparql, sweden on April 19, 2012 by Hannes. Together with my colleague Matthias Palmér I participated in the “Hack4Europe!” competition in Stockholm which has been arranged by the Swedish National Heritage Board in the context of the Europeana project. The goal of the competition was to show the potentials of the Europeana content and APIs by building applications to showcase the social and business value of open cultural data. During the hack day we worked in a team of two (representing our newly founded spin-off MetaSolutions) and developed a showcase to demonstrate how heterogeneous metadata can be managed using an approach that we have developed in research projects both at the Royal Institute of Technology and Uppsala University. During Hack4Europe! a combination of the SCAM framework (EntryStore) and Confolio (EntryScape) is used, and both applications are extended so that they can search in Europeana and extract Europeana metadata from the search results. 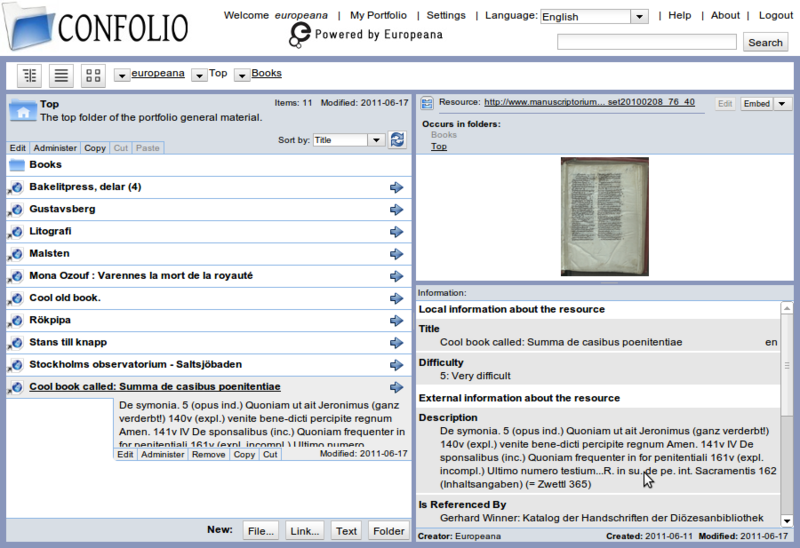 This allows for adding resources directly from a Europeana search result to a user’s personal portfolio for further annotation with educational metadata (or, depending on the use case, some other metadata in a non-educational context). Screenshot of the demonstrated Europeana showcase. The demonstrated use case was to search for resources which are suitable to be used in an educational context and to turn them into learning resources by annotating them with educational metadata. Technically this means searching and caching metadata described using the Europeana Data Model and adding educational metadata (e.g. in LOM/DCAM) on top of it. Everything is integrated into the Confolio interface and the end user does not have to know anything about where the metadata originates from, which standards are used, etc. The annotation process of Europeana content with educational metadata as implemented in our showcase is greatly supported by the Resource and Metadata Management Model (ReM3) which is described in a paper submitted to the Semantic Web Journal (not yet accepted). ReM3 is an information model for keeping track of resources and their metadata. It is based on the concepts of Contexts and Entries where each context manages a set of entries. An entry contains a resource, descriptive metadata about the resource and some administrative information about the entry. case when the same resource is described in different contexts. In a typical situation where already existing metadata is built upon – such as in our Europeana showcase – the referenced resource is described by an additional metadata graph, resulting in at least two metadata graphs per resource: the original one from Europeana and the additional one with educational metadata in our system. The relation between the original external metadata and the newly created metadata is stored in the entry information, where it is indicated that there are multiple descriptions for the same resource. The use of NGs makes contextualisation of metadata possible. Without the fourth piece of information in the quadruple it would be hard to differentiate between triples from different sources. The information structure of ReM3 is represented by a hierarchical URI model which has been implemented as a REST-ful interface using HTTP. An easy-to-use and REST interface which exposes the functionality of ReM3 allows for enrichment of metadata as the protocol makes communication in both ways possible (read/write). Resources in other systems can be described by linking to them and building a connection between the metadata and the resource. Such connections are in turn exposed using Linked Data which integrates heterogeneous information sources. This entry was posted in Linked Data, Programming, Research, Semantic Web, Software and tagged competition, confolio, entryscape, entrystore, europeana, hack4europe, learning, linkeddata, lom, metadata, rem3, rforms, semanticweb, showcase, tel on September 25, 2011 by Hannes. Some time ago (within the Organic.Edunet project that ended in late 2010) I implemented a mapping of IEEE LOM to the Dublin Core Abstract Model (thanks to my colleague Mikael Nilsson who did this work) and also applied it to some bigger data sources such as the repository of the ARIADNE foundation. This post is basically a write-up of what I produced and in which ways it can be used/exploited by others. This is about public data (namely metadata describing educational resources) and a contribution to the LOD cloud. The software used for harvesting, converting, and exposing are the SCAM framework and the Confolio frontend (I’ll post links to these applications as soon as we have some usable documentation online). Organic.Edunet uses the SCAM/Confolio combination natively so a conversion as with ARIADNE was not necessary in the case of this project. One RDF file per harvested repository is exported every Monday morning and can be downloaded from: http://knowone.csc.kth.se/rdf/. This is a direct and metadata-only export from SCAM which means that only educational metadata is included here. I.e. I assume that the ACL, provenance, etc information from SCAM is not of general interest so I don’t include it in the export. SCAM supports contextualized annotation of resources, that’s why all metadata is stored in separate graphs with a URI. This basically means that the same resource (identified by a URI which you can use to download/refer to/view the resource) can be described by different graphs, e.g. in different educational contexts, or simply with some generic metadata and educational metadata on top of it. The format it TriG, mainly because it has the needed support for including information about Named Graphs (and because it is a nice format ;-)). Of course you can import the RDF data into your own triple store and provide/use your own SPARQL endpoint (or use it in a completely different way). If you want to play around before you do this you can also access the public SPARQL endpoint as described below. Using Sesame and Snorql I created a public SPARQL endpoint with a simple interface which you can use to play around. If you intend to use this more heavily in own applications you are kindly asked to setup your own endpoint to avoid hitting the server too hard. The endpoint currently supports SPARQL 1.0. The endpoint currently only contains quadruples generated from the ARIADNE repository. I am thinking of providing also separate endpoints for other repositories, I only have to find a way of maintaining this in a way which it not too much effort. The graph URIs you can request in SPARQL (using the GRAPH keyword, see some examples below) can also be queried using plain HTTP. With content negotiation (either through the HTTP header) you can request different RDF serializations, JSON, and LOM/XML. The response of these requests is a full metadata instance describing a resource, the root of the graph is the resource URI. You can get some administrative information by replacing “cached-external-metadata” by “entry”. If you had username/password an access rights to the SCAM installation you could also perform a PUT in order to update the metadata. I’ll probably post some more examples soon, I provided the examples above only to get the interested ones started. I also hope to be able to upgrade to SPARQL 1.1 soon (the Sesame guys are working on it; looking forward to the next release! ), which provides a more complex query syntax/logic. This entry was posted in Semantic Web and tagged ariadne, dcam, dublincore, ieee, lom, metadata, oer, organic.edunet, query, rdf, resource, sparql on March 28, 2011 by Hannes.